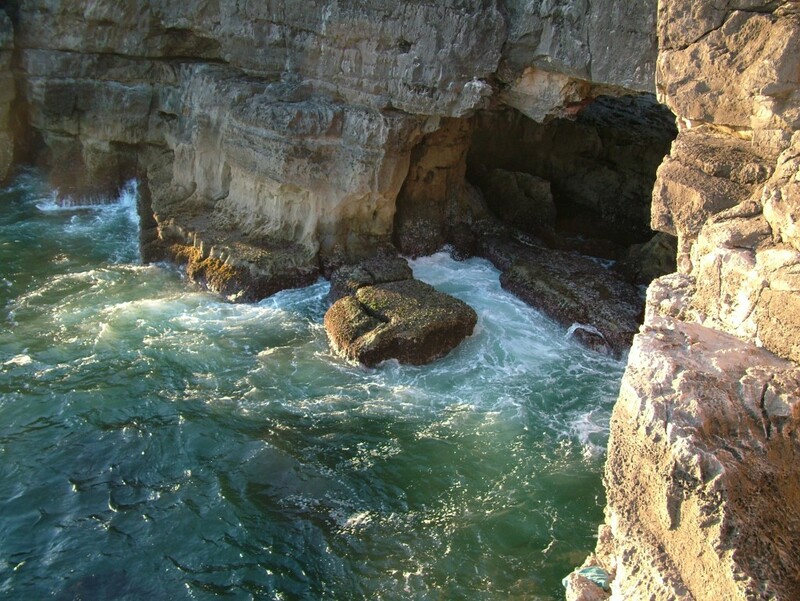 The Boca do Inferno is cliff formation close to Cascais – and the spectacular natural attraction is not to be missed. Portuguese for ‘Hell’s Mouth’, the Boca do Inferno is a small cave that has been chiseled out by the ceaseless pounding of the Atlantic Ocean on the cliff face. This subsequently collapsed and formed a small bay with a natural arch – and this leads to highly varied weather conditions being experienced at the site. In the summer, the waves splash gently against the edge of the cave, but in winter the ocean unleashes all its might into the chasm, which is what gives the rock formation its dramatic name. After the initial excavation of the cave by the water, it has slowly expanded over many generations. The outer rock is incredibly tough, while the weaker rock on the inside of the formation slowly collapsed to create the spot that many tourists venture out to today. It has also become something of a pilgrimage site for those with a passion for the occult, as noted magician, astrologer and mystic Aleister Crowley faked his own death at the site in the 1930s. This was done with the intention of promoting his own work – and Crowley secretly left Portugal, only to reappear three weeks later at an exhibition devoted to his art in Berlin. The Boca de Inferno is situated just 1.5km to the west of Cascais, making it a highly popular walk from the centre of the town. It can be reached by following the Avenue Rei Humberto Ii de Italia past Cascais Marina and along the coastline. This road also has one of the only cycle paths in Portugal – so it can be a good idea to hire a bike for the day. There is no entrance fee to the Boca do Inferno and the site is open 24 hours a day, seven days a week. A set of small market stalls can be found close to the attraction, which sell some of the most popular tourist gifts in Cascais. The walk takes around 40 minutes and most visitors spend around half an hour watching the waves smash against the cliffs or clambering over the rocks.